How do I publish open access was published on openaccess.aalto.fi. The original web page is archived here and it has not been updated since 2015/2016. For up-to-date information, please see the Open Access guide and Aalto.fi web page. 'How do I publish open access?' is produced by Art University Copyright Advice service. The project has received funding from the Ministry of Education and Culture. Art University Copyright Service is maintained by Aalto University and University of the Arts Helsinki. The project explores what open access means for researchers who are applying for research funding, publishing or using open access publications. The material and guidelines are published on openaccess.aalto.fi. How do I publish open access? text by Sari Nokkanen and Maria Rehbinder, illustration by Emmi Kyytsönen / Karppi Design, licensed under a Creative Commons Attribution 4.0 International License. A publisher-defined period of delay during which access to an open access version of the article is not available to users. The period of time between publication of the paper in non-open access form and making an article open access is set up by the journal publisher and is often 6-12 months or longer. After the embargo period open access to the publication is possible. Manuscript. The manuscript version which has not been peer-reviewed. (Please note! Also referred to as open access publishing, Gold OA means that an article is immediately provided in open access mode as published. In this model, the payment of publication costs is shifted away from readers paying via subscriptions. The business model most often encountered is based on one-off payments by authors. These costs (often referred to as Author Processing Charges, APCs) can usually be borne by the university or research institute to which the researcher is affiliated, or to the funding agency supporting the research. In other cases, the costs of open access publishing are covered by subsidies or other funding models. Causes usually additional costs but has no embargo. Also referred to as self-archiving, Green OA means that the published article or the final peer-reviewed manuscript is archived by the author - or a representative - in an online repository before, alongside or after its publication. Repository software usually allows authors to delay access to the article (‘embargo period’). Free of charge for the researcher, but often only after an embargo period. Refers to a journal where only some of the articles are open access. Open access status typically requires paying a separate charge. A fee (variable according to the journal) charged by the publisher of a gold open access publication. Refers to a charge related to publications, used to cover the costs of article processing (e.g. peer-reviewing, editing, publishing, maintaining and archiving). Since open access is free of charge to the end user, different models have been developed to cover the publishing costs, and charging. Article processing charges is one model. Refers to publishers who offer open access for a charge but whose quality and services do not meet the standards set for scientific publications. Vanity publishers are not recognised as established publishers of scientific publications. They approach researchers by, for instance, sending the same e-mail invitation to anyone publishing a thesis in English. While the charges are usually minor, publishing with these publishers may be detrimental to the researcher’s academic reputation. Depositing an article in an institutional or discipline-based repository simultaneously with the official publication and making it openly available to the public, often after an embargo period. Self-archiving process includes the deposit and the requisite embargo period. The publication is available as open access after the embargo. Usually, the self-archived version is the peer-reviewed manuscript, not the final version. Creative Commons licenses are standard-format licenses. Different licences allow a different degree of openness. The most open license is CC0 (CCzero) waiver does not require mentioning authors and it is commonly used e.g. to allow open access to metadata. The CC BY 4.0, which requires giving appropriate credit to the creator, is also approved for free cultural works. For details on licences, see creativecommons.org. On what terms can I use open access publications? Open access to publications ensures that scientific publications: journal articles, monographs, proceedings and conference papers, are accessible to everyone free of charge. This makes scientific publications available to everyone and not just to those who have paid for subscriptions. 1) By self-archiving the publication in an open access repository, referred as the green open access.This open electronic repository can be an institutional repository for the university, shared repository of a discipline, or a subject-based or centralized repository (e.g. arXiv) or other form of open access repository (e.g. Zenodo). 2) By publishing an open access article in a journal. This is usually referred as the gold open access. The journal may be either a fully open access journal either requiring author payments (APC, article processing charges) or a journal that does not require such payments.Gold open access may also refer to a subscription journal, which allows individual articles to made open access on payment of an APC fee.These kind of journals are usually referred to as hybrid journal. Many publishers allow the final peer-reviewed manuscript (that is without the publishers layout, page numbering or logo), to be archived by the author in an online institutional repository such as a university database, alongside or after its publication. Some publishers request that open access be granted only after an embargo period has elapsed. Open access repositories make publications easier to manage and find: Users do not have to seek information separately in several databases thanks to web search engines such as Google Scholar that indexes the full text or metadata of scientific literature from different publishing formats and disciplines. See a video on the effect of open access on the visibility and accessibility of works. Open access saves researchers the trouble of organising their own archives, as they can easily and reliably deposit their article in a repository with guaranteed management and backup. For long-term preservation, institutional repositories such as university databases are a safer option than commercial ones, as the university cannot guarantee the long-term preservation of articles in commercial services (e.g. Mendeley, ResearchGate), and the university is responsible for the preservation of the material to the agency funding the study and to the science community. Open Access scientific publications must be open for reading and evaluation to researchers and the general public alike free of charge, if not immediately, at least after an embargo period [see terminology]. 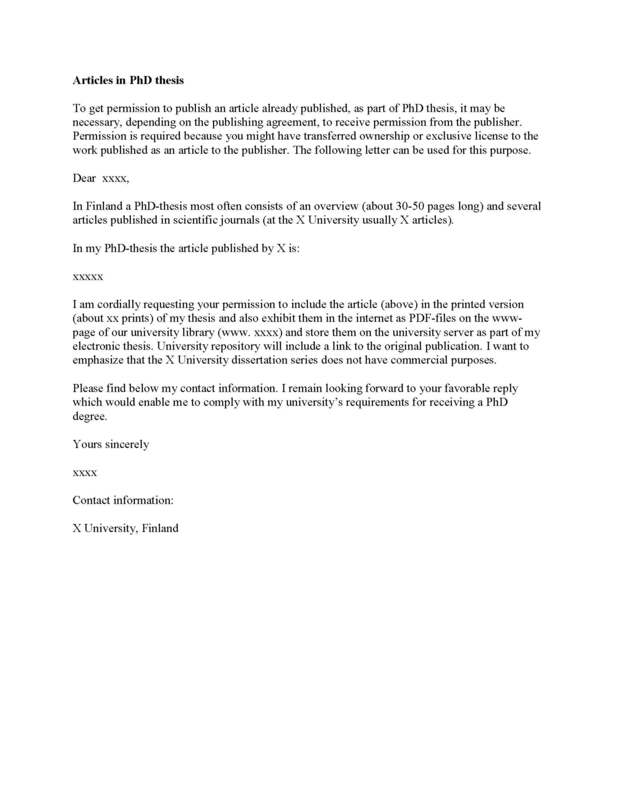 Many publishers continue to require an embargo period (usually 6-12 months), during which the article is only available to the paying subscribers of the journal. European Commission recommends, that there should be open access to publications resulting from publicly funded research. Horizon 2020, the EU Research and Innovation programme, requires that under Horizon 2020, each beneficiary must ensure open access to all peer-reviewed scientific publications relating to its results no later than no later than 6 months after the date of publication, and 12 months for social sciences and humanities , Model Grant Agreement for Horizon 2020, article 29.2. Each beneficiary must ensure open access (free of charge, online access for any user) to all peer-reviewed scientific publications relating to its results according to H2020 General Model Grant Agreement . Enablers and barriers to Open science have been described in more detail in the publication Science 2.0, Science in Transition, released by the European Commission in February 2015. Open access may be viewed on Open Access Spectrum guide. The Open Access Spectrum standardizes open access terminology in an easily understandable way, and shows a scale of open access publishing, where openness may mean either a very extensive or a more limited possibility for reuse. Open access spectrum illustrates a nuanced continuum of more versus less open to enable users to compare and contrast different publications and policies. EU funding instrument Horizon2020 has Guidelines on Open Access, and it is required that open access to the scientific publication is ensured within at most 6 months (12 months for publications in the social sciences and humanities) after the original date of publication. Each beneficiary must ensure open access (free of charge, online access for any user) to all peer-reviewed scientific publications relating to its results according to H2020 General Model Grant Agreement, article 29.2. Horizon2020 open access requirements are not an obligation to publish results and do not interfere with the decision to exploit research results commercially, e.g. through patenting. The decision on whether to publish open access must come after the more general decision on whether to publish directly or to first seek protection. The costs of open access publishing are eligible costs in the EU projects, which means they can be included as project costs. EU recommends this practice also for national funding agencies. Horizon2020 (like most other funding instruments) accept the peer-reviewed manuscript, (also called the post-print) for self-archiving. Bear in mind, thet after the project ends funds are no longer available for Article Processing Charges and there has to be some other source of funding. A pilot has been launched to fund OA publications for finalized FP7 projects through the OpenAIRE project. The FP7 post-grant pilot is being developed in the context of the OpenAIRE2020 project, and is aligned with the Open Access infrastructure and support network provided by OpenAIRE. CERN requires that the projects funded by it publish their results as open access and recommends that the field of physics use SCOAP3, http://scoap3.org/ , publications, which allow open access free of charge. Research Councils UK requires open access publishing of peer‐reviewed research articles which acknowledge Research Council funding which are published in journals or conference proceedings. These are required to be made available as open access usually within 6 months of the publication of the original article, and in the case of papers in the arts, humanities and social sciences, within 12 months. National Institutes of Health (NIH) requires that the research funded by it be made publicly available in the National Library of Medicine’s PubMed Central no later than 12 months after the official date of publication of the article. Wellcome Trust requires electronic copies of any research papers that have been accepted for publication in a peer-reviewed journal and are supported in whole or in part by Wellcome Trust funding, to be made available through PubMed Central (PMC) and Europe PMC (Europe PMC) within six months of the journal publisher's official date of final publication. Similarly, monographs and book chapters must be made available through PMC Bookshelf and Europe PMC with a maximum embargo of six months. The Wellcome Trust provides grantholders with additional funding to cover open access charges. The open access requirements set by research funding agencies are constantly becoming more clear and specific. Many funding agencies require open access publishing under a certain open licence such as Creative Commons 4.0 suite. For details on the open access policies of different research funding agencies, see the Sherpa/JULIET service. The Academy of Finland requires that Academy-funded projects commit to open access publishing. Academy urges projects to make their research data and methods freely available. The goal is to make research publications, data and material, metadata and methods widely available for further use. If researchers follow the principles of open science, they must do so with due consideration of research ethics and the judicial environment. .Green Open Access means that researchers publish their articles in traditional subscription-based scientific journals and deposit parallel copies in online open access repositories. The Academy does allow for an embargo period following the practices of international funders. The Academy also supports Gold Open Access. This means that a publication is immediately provided in open access mode by the scientific publisher. In this case, the publisher may charge an open access fee (article processing charge). This fee may be included in the research costs of the project. A parallel copy of the article should also be deposited in an open access repository. The Academy of Finland does not, however, recommend publishing in ‘hybrid journals’, where the publisher may charge both an open access fee and a subscription fee. Tekes - the Finnish Funding Agency for Innovation is committed to the objectives and approaches of open access science and research. Tekes aims to make publications and the non-confidential information resulting from public research readily available for further use. Tekes recommends open access publishing in public research projects by Tekes. Tekes recommends to consult your own organisation's guidelines on open access publishing. For additional information on the different institutes policies see, the Registry of Open Access Repository Mandates and Policies ROARMAP. Below examples from fall 2015. Check the current policy from university website. When the policies of the funding agency and those of the publisher are not in conflict, i.e. if the funding agency requires open access to the publication e.g. within 6 months and the publisher allows it, the route to use is to deposit and publish the article on the publication electronic archive used by your university or employer. This is Green Open Access. Often however, the embargo period of the publisher is longer than that of the funding agency, in which case you have to use Gold Open Access. In gold open access, the publisher publishes the article immediately for all readers, and to cover the costs of publication an article processing charge is usually required. This article processing charges or APC vary from a few hundred euros up to a few thousand euros, so you should check the charges in advance on the publication website. For example, see Springer Open. Universities often have agreements with some publishers, whereby the university may pay for a portion of the costs or get a discount on the charges; you can find out more about the agreements from the library of your university. The research funding agencies requiring or encouraging open access usually consider the associated costs as eligible project costs. It is sufficient to estimate the number of your publications and the related costs and in the appropriate item in the budget of your funding application. If you have not included them in the budget initially, the publishing costs have to be taken out of funds allocated to something else in the project or you will have to obtain additional funding to cover for them. How can I publish through open access? How to choose the right publication channel? What does open access cost? How is copyright taken into consideration? Which licence to choose for open access publications? Open access is a powerful tool: it gives the authors of a scientific publication a worldwide audience and increases the visibility and impact of their work. An article by Alma Swan The Open Access citation advantage: Studies and results to date (2010) presents a summary of studies on the increase in citation counts due to open access. The article starts with a brief introduction to the main methodological and interpretative questions of the covered studies. The list of studies provides details on the scope, methodological approach and conclusions of each study. The table below presents a summary of these studies. (Source: Swan, Alma: The Open Access citation advantage: Studies and results to date). Look into the publication channels relevant to you. Which journals are you going to offer your articles to? Usually, this choice should be based on scientific impact of the channel, because that is the most important criterion for both the study and your career, and also often required by the university. Beware of predatory publishers, who charge publishing fees but do not meet the standards set for high-quality journals. For additional information and lists of publications suspected to be offered by predatory publishers, see the Scholarly Open Access service. The use of certain repositories may be required by funding agencies, research institutes and universities. Institutional, subject-based and centralized repositories are all possible choises provided that these have been accepted by the publisher in question. Researchers of a given university are usually required to self-archive their publications in the repository of the university. Usually, university databases require at least one of the writers to be in an employment relationship or otherwise affiliated with the university.To find out about discipline-specific alternatives, it is worth contacting the library or your colleagues. OpenAIRE, www.openaire.eu, aims to support the implementation of Open Access in Europe. It provides the means to promote and realize the widespread adoption of the Open Access Policy, as set out by the European Commission and European research Council.. It is aimed at linking the aggregated research publications to the accompanying research and project information, datasets and author information. The goal is to make through the portal as much European funded research output as possible available to all. This research output, whether it is publications, datasets or project information is not only accessible through the OpenAIRE portal, extra functionalities are also offered, such as statistics, reporting tools and widgets – making OpenAIRE a useful support service for researchers, coordinators and project managers. In addition, researchers are often recommended to use discipline based repositories provided their use is not in conflict with the rules of the publisher. Options for a discipline based repository can be found from http://www.opendoar.org/. For example, Aaltodoc Publication Archive in OpenAIRE. A repository, funded by Cern and OpenAIRE, covering the research fields is Zenodo. It is an open dependable home for the long-tail of science, enabling researchers to share and preserve any research outputs in any size, any format and from any science. ArXiv.org is a repository in multiple fields of physics and plays an increasingly prominent role in mathematics, computer science, quantitative biology, quantitative finance, and statistics. It is administrated by the University of Cornell Library. For long-term preservation, institutional repositories such as university databases are a safer option than commercial ones, because the university cannot guarantee the long-term preservation of articles in the commercial ones. When you have chosen the journals best suited for your research, find out about their open access policies. A good way to do this is checking the SHERPA/RoMEO service (instructions) [linkki ei toimi], but usually also the universities’ libraries are able to help you in this. When the policies of the funding agency and those of the publisher are not in conflict, i.e. if the funding agency requires open access to the publication e.g. within 6 months and the publisher allows it, the Green Open Access route is available, which is free of charge. Often however, the embargo period of the publisher is longer than that required by the funding agency, in which case you have to choose Gold Open Access. In gold open access, the article processing charges vary from a few hundred euros up to a few thousand euros, so you should check the charges in advance from the publication website, where they are usually listed under article processing charges (APC). Below are links to some publishers open access terms. The Sherpa/ RoMEO service provided by University of Nottingham provides summaries of general open access policies of publishers. Individual journals may also have some rules that differ from the usual practices. The current details have been added in 2015, so please see the publisher sites for the most recent information. Guide to interpreting the Sherpa/RoMEO service [linkki ei toimi] for clear instructions on the use of the service. The accuracy of the Sherpa/RoMEO details is sufficient for applying for funding, but when concluding the actual publishing agreement, check the details directly from the journal publisher. When checking the publisher open access policy, be sure to check the embargo period and compare it with the maximum embargo allowed by the funding agency funding your research. For example for Horizon 2020 funded research the maximum embargo period is six months from publication except for twelve months for publications in the social sciences and humanities. Open access does not necessarily incur extra costs: if the terms and conditions of the publisher are in line with those of the funding agency, you can allow open access free of charge (Green Open Access). If you have to choose publishing in journals that charge for open access (Gold Open Access), it will mean additional costs, article processing charges (APC), for your research project. Universities often have agreements with some publishers, whereby the university may pay for a portion of the costs or get a discount on the charges; for more detailed information, you should consult the library of your university. The research funding agencies requiring or encouraging open access (e.g. the Academy of Finland, the EU) usually consider the article processing charges as eligible project costs. As with any research, the patent application must be filed before disclosing the invention. When the patent application has been submitted to the relevant authority, an article explaining the invention may be published as open access or otherwise. Also other intellectual property rights such as the trademark and design rights may be registered. Early registration of intellectual property rights is the most recommended option from the viewpoint of commercialisation. According to the Copyright Act (404/1961), the copyright to a work is invested in the author/authors person who has created a literary or artistic work, unless otherwise agreed. The Finnish Copyright Act 404/1961 does not have a work-for hire clause, so agreements are needed between the researcher and the university to agree on matters involving copyright, including agreements on open access publishing in the university repository. Copyright must be agreed on in the employment contract or in a separate agreement concluded with the university. In case of more than one author, copyrights are vested in all authors, which means that allowing open access to the publication requires permission from all copyright holders. For example, in France and in the Netherlands, the appropriate copyright acts do not allow the author to competently give up his/her right to publish open access. The author makes an agreement concerning his/her rights when publishing an article. To allow the publication to be deposited in the university repository as required by universities, the researcher has to ensure he or she has the right to do so. This may be achieved by the author and university agreeing on the right to self-archive before the article is published and making it known to the publisher at the latest when a publishing agreement is made. 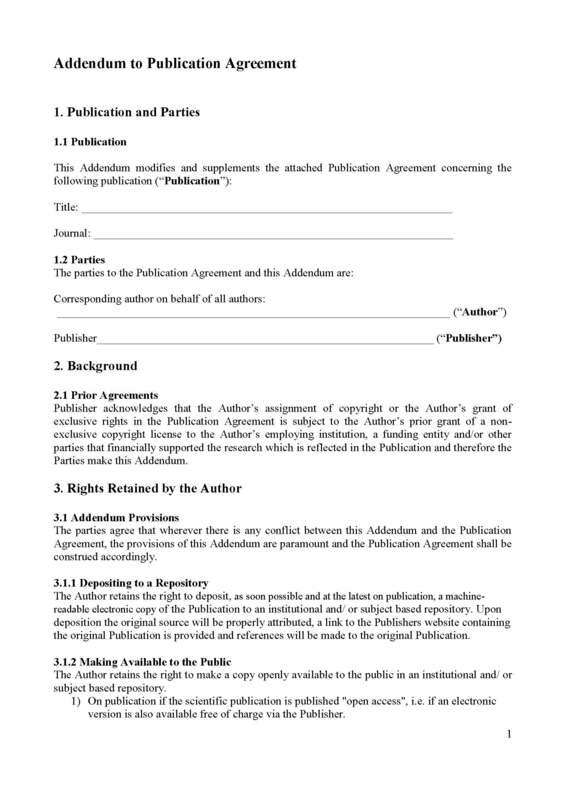 The needed changes to the publishing agreement may be made with the template provided below. If the publisher publishes the article under a licence allowing self-archiving, such as the Creative Commons CC-BY 4.0. license suite, self-archiving in the university repository is possible under the same licence. Gold Open Access usually allows the publication to be deposited in the university repository without delay. Researchers signing a publishing agreement have to specify whether they are signing in the capacity of a copyright holder or as a university representative, representing the university to which copyright ownership has been been transferred to. generally, Finnish universities do not require researchers to assign the ownership of copyright of their scientific articles to the university. This means that the standard practice is for researchers to sign the publishing agreement as the copyright holder. Openness may be viewed on a scale of openness where openness may mean either a very extensive or a more limited possibility for re-use. If the publications are used for information search or used as citations with attribution of author and source, no licence is needed: citation, for instance, is permitted in the Copyright Act (404/1961). Elsevier allows authors to self archive attaching a CC-BY-NC-ND license to the self archived manuscript. This license does not allow commercail use or dervatives. Wide rights to re-use a publication are given when publishing them under the Creative Commons CC BY 4.0 licence permitting also commercial reuse. Uses under this licence have to comply with the BY or Attribution requirement, meaning that the authors and sources must be appropriately credited as specified in the license. CC BY 4.0 is a license recommended by the Open Science and Research 2014-2017 project of the Ministry of Education and Culture for publication of scientific research data. A permission for commercial reuse is often necessary because further research using the research data may also be conducted in collaboration with industry. When metadata is published, the waiver CC0 is recommeded; by the Open Science and Research 2014-2017 project . In the waiver there is no requirement to mention the persons who have provided the metadata. However, it can be recommended that the instituion and sources are credited. When research data is published, the waiver CCO is an option; in that case, there is no requirement to mention the persons who have provided the data.. However, it can be recommended or requested that the authors and sources are appropriately credited.Requesta are made so that the authors and sources are appropriately credited in accordance with certain guidelines, Rules of the Road, instead of a licence. If the attribution is a term of the license like in the Creative Commons Attribution or CC BY 4.0 license , then use is only allowed if the term of the license , attribution, is appropiately given. The Finnish Copyright Act, Tekijänoikeuslaki 8.7.1961/404, does not have a general work-for-hire clause. Some user rights are assumed to be given to employer according to legal opinions and literature, but agreements are needed between the researcher and the university to agree on matters involving copyright, including agreements on open access publishing in the university repository. Use of copyright protected material must be agreed upon in the employment contract or in a separate agreement concluded with the university. In case of more than one author, copyrights are vested in all authors, which means that allowing open access to the publication requires permission from all copyright holders. In Finnish universities it is the researcher who owns the copyright to his / her scientific article, it is the researcher who signs the copyright agreement with the publisher of a scientific publication. We’re planning a research project. When should we think about open access questions? It is worth considering open access in the plans and budget of the project from the very beginning. When writing the funding application, you should negotiate with the other possible members of the consortium to decide whether to choose Gold or Green open access. The choice made must then be considered in the budgets in the funding applications and the consortium agreements. If gold open access is chosen the budget has to accommondat Article Processing Charges (APC) that can be 1500-3000 / per article. Obtaining additional funding afterwards may be difficult, and even if the funding agency approved Article Processing Charges as eligible project costs, the costs will in such cases have to be taken out of funds originally allocated to other purposes. Often articles are published also after the project ends. The APC fees can no longer be paid from projects funds after the project has ended, ther has to be some other source of funding budgeted. I am writing a funding application to the Academy of Finland. Which publications should I mention in the application? How much money can I budget for costs of open access? Your application should mention the most esteemed publications of your field that are the best suited for your research, because they give your research the best impact and boost the competitiveness of your application. Check the SHERPA/RoMeO service to see whether the publications you have chosen allow self-archiving the publication free of charge (Green Open Access). If the journal charges for open access (Gold Open Access), you may include reasonable publishing costs in the budget in your application (e.g. 1500 to 2000 euros/article, the charges vary by publication, so check the price on the journal site). The Academy of Finland requires making publications open access. Why are there green and gold open access routes? Open access by self-archiving the publication for instance in the university repository is free of charge for the author and can meet the open access criteria of the funding agencies. Publishers do not however, always consent to allowing free-of-charge open access simultaneously or in the time period required by funding agencies, because they wish to get payments also from the journal subscribers. This is why publishers offer open access for an article processing charge (APC) and set an embargo period for self-archiving. If the embargo period required by the publisher is longer than the embargo period allowed by the funding agency, the gold open access route has to be selected. Why have you set up this national site? This website provides information about open access publishing that is not university specific but aims to be useful to all researchers, universities and research institutions. For contact information for the unit responsible for open access publishing and open access guidelines of a given university see Open access at Finnish universities. This website project received funding from the Ministry of Education and Culture. Do I have to include the costs of open access in the budget of my project? Open access is free of charge in many cases, if not immediately, after an embargo period (e.g. 6 months) after which you can self-archive the article in the repository of your university. If the rules of the publisher are in conflict with the terms of the research funding agency (e.g. an embargo period exceeding 6 months in the Horizon 2020 project in other fields than the humanities and social sciences), you have to consider choosing Gold Open Access. The associated (APC) charges can, however, be included in the budget sent to the funding agency, but this must be done in the application phase. At some universities, the departments cover some of the publishing charges. Is there an open access publishing channel suitable for my article with the working title Xxxxx? You can ask the library of your university to do a search by topic and to find possible journals of interest. You should also consult your colleagues who may have experience of the matter, and look into your options for open access. Do you know whether it is worth publishing in the “Systema - Journal of the Bertalanffy Centre for the Study of the Systems Sciences”? The library can help you by searching the various databases measuring the quality and impact of publications (Publication Forum of the Federation of Finnish Learned Societies, Elsevier Scopus, Thomson Reutersin Web of Science (WoS), Proquest, Directory of Open Access Journals (DOAJ). Since the journal you mentioned is new, it is not found in these databases. To find out about the quality of the journal, you can ask your colleagues and look at articles previously published in it. You should also ask the publisher about their open access policy. What do you think would be a suitable journal for my article in the field of art titled “xxxxxx”? How can I find out if the publication offers opportunities for open access? The library can help you by searching the various databases measuring the quality and impact of publications (Publication Forum of the Federation of Finnish Learned Societies, Elsevier Scopus, Thomson Reuters Web of Science (WoS), Proquest, Directory of Open Access Journals (DOAJ). [links are added only in previous section] The search results may be compared in terms of the preferred viewpoint of the researcher being presented in the journal previously. For details on the self-archiving policy of the publication and any embargo periods set may be found either on the publication site or in the SHERPA/RoMEO service. Is the publisher Scientific Online Publishing (USA), which offers open access publishing, a reliable publisher? publishes non-academic texts or copies of others’ texts etc. For additional information on the criteria and their application, see the Scholarly Open Access service. Unfortunately, the publisher you mentioned is found on this list. We are coordinating a H2020 project in which we have also corporate partners. Which repository can they use to deposit their publications if there are no university/research institute partners whose repositories could be used? Are there lists by discipline/any recommendations available? Usually, university databases require at least one of the writers to be in an employment relationship or otherwise affiliated with the university. Zenodo is an open dependable home for the long-tail of science, enabling researchers to share and preserve any research outputs in any size, any format and from any science. It is possible to accept or reject uploads to your own community collections (e.g workshops, EU projects or your complete own digital repository). There is integrated in reporting lines for research funded by the European Commission via OpenAIRE. Research output is stored safely for the future in same cloud infrastructure as research data from CERN's Large Hadron Collider. To find out about discipline-specific alternatives, it is worth contacting the library or asking your colleagues.